As of 2018, Wolters Kluwer ranks as the Netherlands' biggest publisher of books in terms of revenue. Other notable Dutch houses include Brill (est. 1683) and Elsevier (est. 1880; now part of UK-based RELX Group). Printed books first appeared in the 1470s in places such as Delft, Deventer, Gouda, Nijmegen, Utrecht, Zwolle, and in the 1480s in places such as Haarlem, Leiden, and 's-Hertogenbosch. Among Dutch bestsellers are titles such as the 17th century "Lusthof des Gemoets" by Jan Philipsz Schabaelje. The Stichting Drukwerk in de Marge [nl] (printing society) formed in 1975, and organizes an annual Boekkunstbeurs (book fair). Bibliophiles in 1991 organized the Nederlands Genootschap van Bibliofielen [nl]. The United Nations Educational, Scientific and Cultural Organization named Amsterdam the 2008 World Book Capital. Historians of the Dutch book include Piet Buijnsters [nl]. 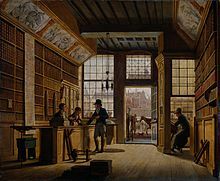 The Leiden University Library began in 1575, and the Koninklijke Bibliotheek (royal library) in The Hague in 1798. Since 1919, the Nederlandse Centrale Catalogus lists titles in Dutch libraries. ^ Euromedia Research Group; Mary Kelly; et al., eds. (2004). "Netherlands: Book Publishing". Media in Europe (3rd ed.). Sage Publications. ISBN 978-0-7619-4132-3. ^ "Jan Philipsz Schabaelje, 1585?-1656". WorldCat. Retrieved 9 December 2017. ^ "Over ons". Drukwerkindemarge.org (in Dutch). Drukwerk in de Marge. Retrieved 9 December 2017. ^ "Over het Genootschap". Bibliofielen.nl (in Dutch). Nederlands Genootschap van Bibliofielen. Retrieved 9 December 2017. ^ Philip G. Altbach; Edith S. Hoshino, eds. (1995). International Book Publishing: An Encyclopedia. Garland. ISBN 9781134261260. This article incorporates information from the Dutch Wikipedia. G.W. Porter; G.K. Fortescue, eds. (1889). "Bibliographies of Countries: Netherlands". List of Bibliographical Works in the Reading Room of the British Museum (2nd ed.). London. OCLC 3816244 – via Internet Archive. Robert Proctor (1898). "Books Printed From Types: Holland". Index to the Early Printed Books in the British Museum. London: Kegan Paul, Trench, Trübner and Company. pp. 652+. OCLC 6438080 – via HathiTrust. Gerard van Thienen; John Goldfinch, eds. (1999). Incunabula Printed in the Low Countries: A Census. Bibliotheca Bibliographica Neerlandica. Brill. ISBN 9789060044520. Lotte Hellinga; et al., eds. (2001). Bookshop of the World: The Role of the Low Countries in the Book-Trade, 1473-1941. Brill. OCLC 50123419. Marieke T G E van Delft; Clemens de Wolf, eds. (2003). Bibliopolis: History of the printed book in the Netherlands. ISBN 9040088381. Andrew Pettegree; Malcolm Walsby, eds. (2011). Netherlandish Books: Books Published in the Low Countries and Dutch Books Printed Abroad before 1601. Brill. ISBN 9789004191976. Rémi Mathis; Marie-Alice Mathis (2015). "Books in Foreign Languages: Publishing in the Netherlands, 1500–1800". In Richard Kirwan; Sophie Mullins (eds.). Specialist Markets in the Early Modern Book World. Brill. ISBN 9789004288102. Piet J. Buijnsters (2010). Geschiedenis van de Nederlandse bibliofilie. 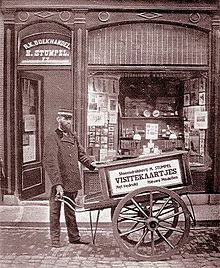 Boek- en prentverzamelaars 1750-2010 [History of the Dutch bibliophile: book and print collectors] (in Dutch). Nijmegen. ISBN 9789460040436. Erica van Boven (2015). Bestsellers in Nederland, 1900-2015 (in Dutch). Antwerp: Garant [nl]. ISBN 978-90-441-3288-5. Wikimedia Commons has media related to Books from the Netherlands. "Nederlandse Boekhistorische Vereniging" [Dutch Book Historical Society] (in English and Dutch). "Dutch Printed Collections, 1501-1850". Help for Researchers. UK: British Library.